This book appealed to me straightaway as I like to read fiction about how the internet and social media in particular play a part in our everyday lives these days. The book starts with lengthy sections devoted to each of the four main characters. Rachel has severe post-natal depression following the birth of her second child and the first part of her section is quite shocking. I found myself almost holding my breath. I think Hayley Mitchell portrays Rachel’s despair really well but then we see it from David’s point of view, Rachel’s husband. He’s struggling to cope without the vivacious wife he used to know. Enter Adam, who Rachel spots on Facebook and rekindles a ‘one that got away’ online relationship with him. Adam is suffering from depression himself due to a terrible thing that happened in his life and he doesn’t feel like his wife, Julia, understands him anymore. And Julia in her turn is frustrated by Adam’s wallowing, self-pitying obsessive behaviour. These four parts make up the first half or so of the book. I did find some of it a little slow, I think because there was a lot of scene-setting and little dialogue. However, the second part is the lives intertwined and then the story really took off for me and I raced through to the end. The effect of social media is a fascinating thing to consider. Many of us are probably guilty of spending ages searching for people we used to know, even the most tenuous of acquaintances, so imagine being vulnerable and coming across not only a kindred spirit but one that you have thought about many times over the years. I loved the characterisations in this novel. Rachel and Adam’s flawed and compulsive personalities were well-drawn and I sympathised with them as they were drawn further towards each other and further away from their long-suffering spouses. As I was getting closer to the end I couldn’t think how the author would tie up each strand. As it was, I think it ended well as it left me wondering but with ideas as to what might happen to the characters in the future. I found Because You Were Lonely to be a sad, sometimes heartbreaking, novel of love, loss, depression, loneliness and longing and I thought it was so very well written. My heart ached for them all. With thanks to the publishers and New Books for the review copy. 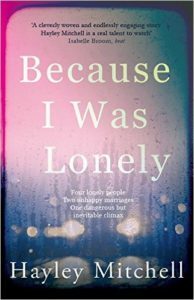 Because I Was Lonely is published in paperback on 2nd March 2017 by RedDoor Publishing. This sounds like a very well-written emotional story! I spend a lot of time online because I work from home and suffer from different things that prevent me from interacting with people on a daily basis so I like the social media aspect of it, too. Great review. It’s really lovely, Donna, I’d definitely recommend it. I’m much better at interacting on the internet than I am in real life so the social media aspect appealed to me for the same reason. Thanks for stopping by and commenting. Oops! RedDoor only publish paper books, not ebooks, if that matters to you.